Kudremukh is equivalent to Heaven in south india . Blessed with Lush Greens Meadows everyewhere , the charishma of place remains forever . Known for its bio-diversity and mineral wealth .In Kannada, Kudremukh means ‘horse’s face’ and the place gets its name from a peak that resembles the face of a horse. The beautiful landscapes of Kurdremukh are a big crowd puller.There are dense forests around the town and wildlife spotting is popular, even though the forest cover makes it difficult to spot animals easily. You need to go deep in the jungle to catch a glimpse of the wildlife. Three vital rivers — Bhadra, Nethravati and Tunga — originate from the region. Kudremukh enthrals every one with his beauty and being the third highest peak in karnataka . It will be an ideal place if you nature over and can’t resist being a tramp in the world . You may call it as himalay of south . he town of Kudremukh is primarily an iron ore mining town where the government run Public Sector Kudremukh Iron Ore Company Ltd. (KIOCL) operated till the last decade.Kudremukh region was declared as a reserved forest in the year of 1916, to stop the extensive cut and burn agricultural practices from entering into the Ghats. Environmentalist Dr. Ullas karanth did a systematic survey in 1983 to 1984, and observed that kudremukh is an extensive and suitable habitat for lion – tailed macaque most probably the tract has largest population of lion-tailed macaques in the Western Ghats exterior to Malabar region. 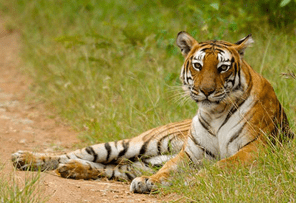 Animals – Tiger, Leopard, Wild dog, Jackal, Lion-tailed macaque, Common langur, Sloth bear, Gaur, Sambar, Spotted deer, Barking deer, Malabar giant squirrel, Giant flying squirrel, Porcupine, Mongoose etc. Birds – Malabar trogon, Malabar whistling thrush, Great pied hornbill, Imperial pigeon etc.